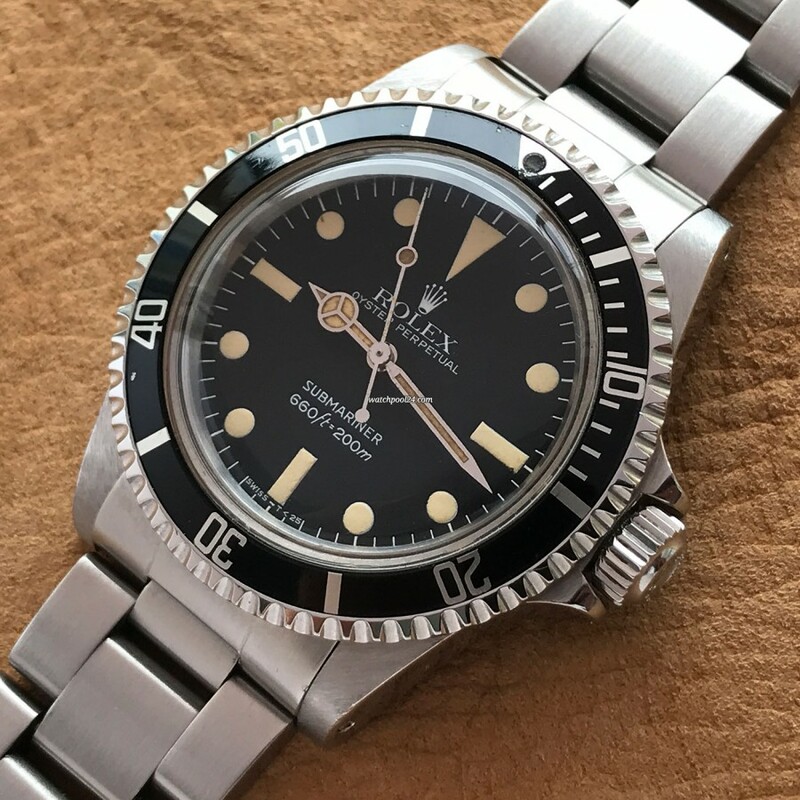 This is a rare Vintage Rolex Submariner 5513 with Maxi IV dial from 1982 with punched papers and an original hang tag signed with the serial number. When talking about legendary diving watches, you will not get along without the Rolex Submariner. The different versions of the dials, hands, etc. fill books and are still hotly debated among vintage lovers. The dial of this particular Submariner is the "Maxi IV" with large tritium dots: the inscription "SUBMARINER" is above the depth rating and the "S" in "SUBMARINER" has a zig-zag shape. The black, matte surface of the dial is flawless. The tritium lume in the hour markers has a beautiful vanilla color. The Oyster case has been preserved great and has sharp edges. The numbers between the lugs are clearly legible. The black bezel is in very good condition. The pearl at 12 o'clock is missing and at 8 o'clock is a small white spot, which is barely visible. The large triplock crown is protected by the round crown guards. The available accessories increase the value of this Rolex Submariner 5513 and make it very collectable. The original papers are punched with the serial number. This watch was sold on December 28, 1982 by the official Rolex retailer in Hong Kong. At that time, Oriental Watch Co., LTD was one of the few (if not the only) concessionaires in Asia to which Rolex delivered the punched papers and not the blank papers. In addition, you will receive the original Rolex hang tag - labeled with the serial number of the watch. The movement is the Rolex caliber 1520. The watch has been checked and is keeping good time. The original Oyster stainless steel bracelet is in top condition. The reference number of the bracelet (93150) and the end pieces (580) are correct for the Submariner 5513. The clasp code is K1. The condition of the case, the purity of the dial and the papers with the hang tag make this Rolex Submariner 5513 a really special and rare vintage watch.